Now, before we kick off, let’s just clear something up. 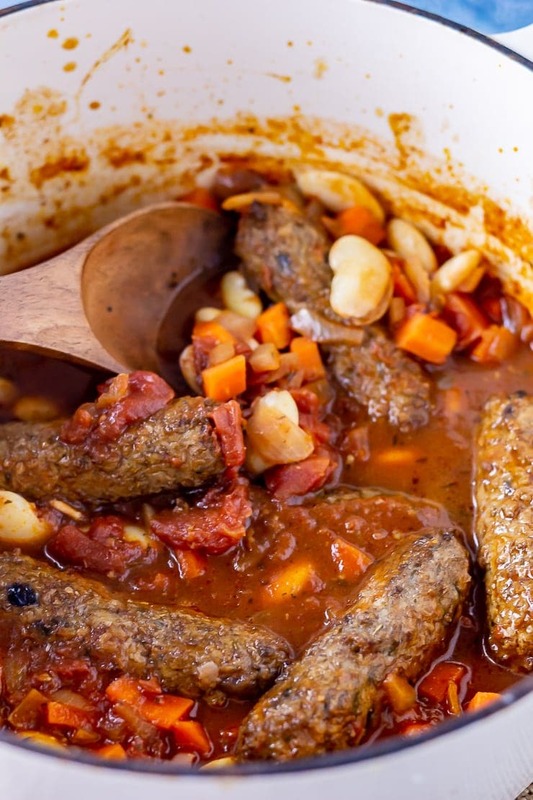 You can totally make this sausage casserole with meat sausages if you prefer. I chose to use vegetarian sausages for various reasons. First, because I’m not that into meat sausages, I don’t know what it is about them but they just don’t really appeal. Secondly, as I’ve mentioned several times on the blog, Will and I are trying to cut down how much meat we eat. We didn’t eat huge amounts before but we’ve now almost completely cut it out of our cooking and only have it a) when we’re really craving it or b) on special occasions/when eating out. 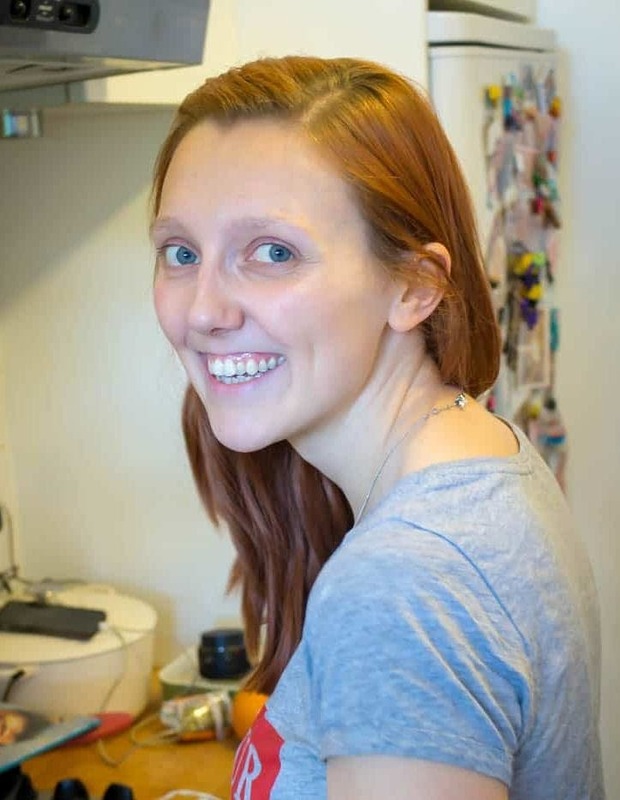 Because of this we’ve been trying out lots of recipes using veggie sausages. 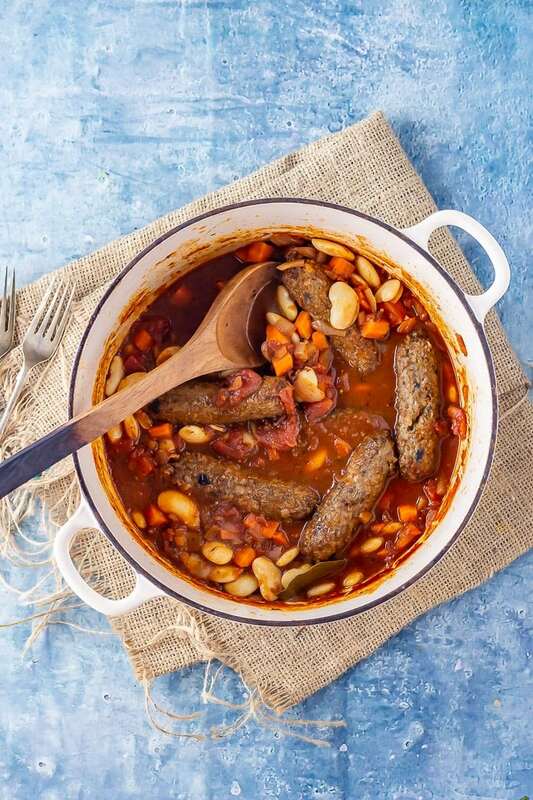 I quite like veggie sausages in their own right and have really enjoyed adding them to various different recipes. 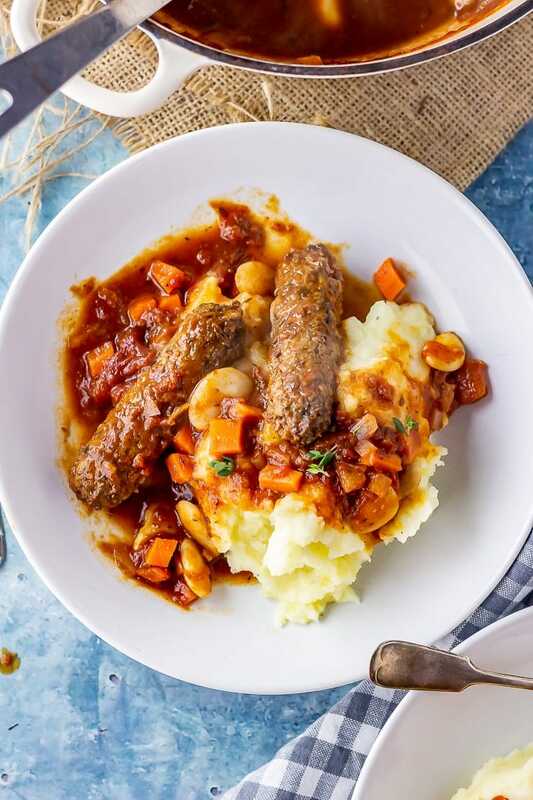 I’ve discovered that they work pretty well in vegetarian toad in the hole and vegetarian breakfast burritos and now I’m adding them to a vegetarian sausage casserole. 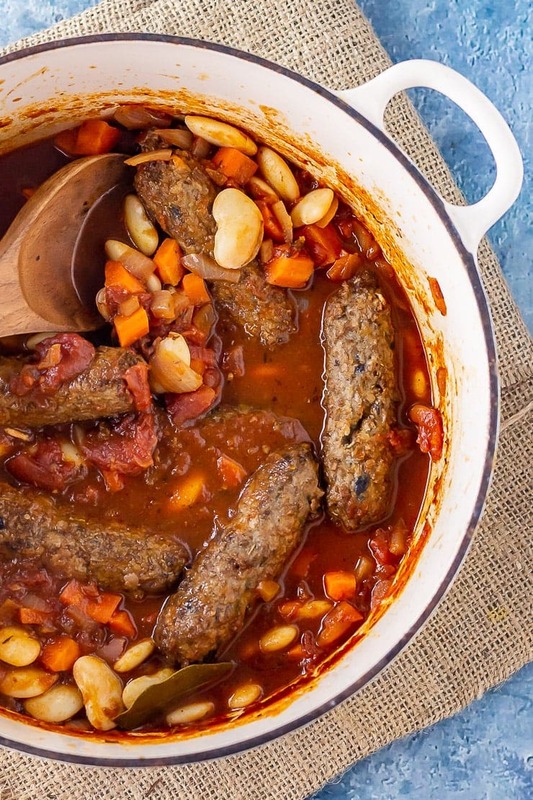 What’s nice is that using vegetarian instead of pork sausages actually makes this a pretty healthy sausage casserole. 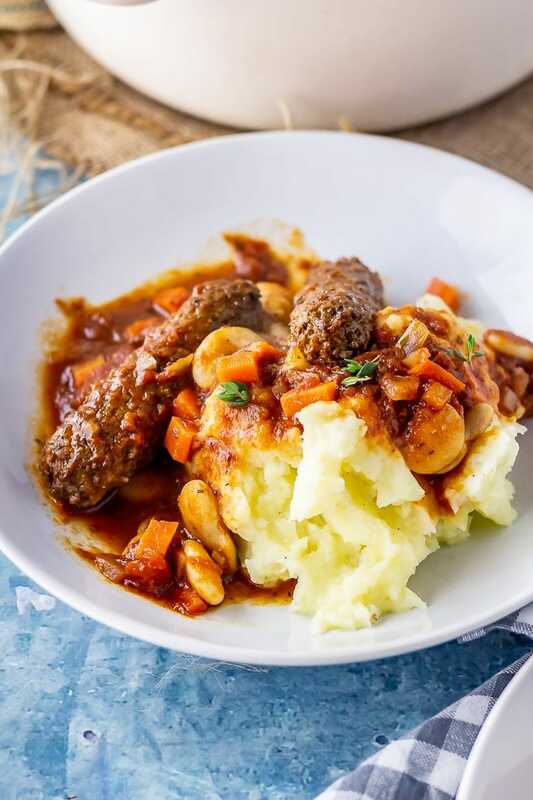 So, other than the vegetarian sausages, we’ve got all your classic casserole ingredients. A rich tomato sauce is made with chopped tomatoes, smoked paprika, Worcestershire sauce, dark brown sugar, red wine and plenty of herbs. 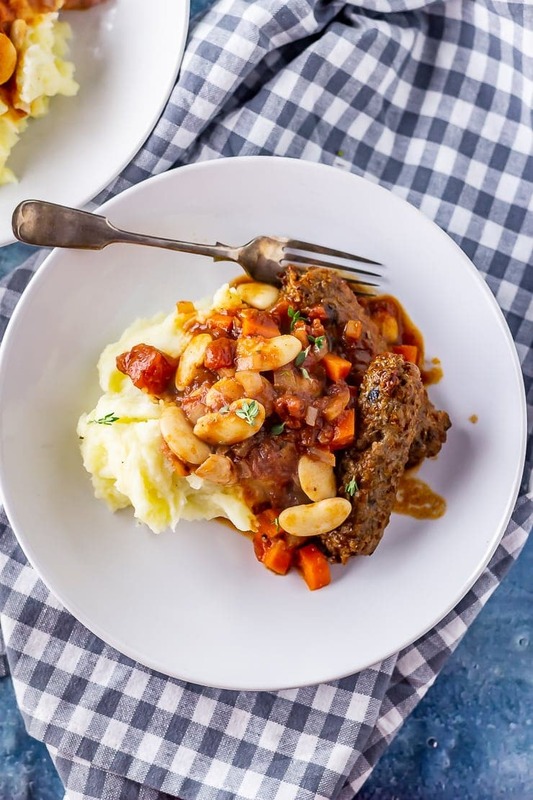 The sauce tastes so amazing that it seems like it’s been cooked for hours but the amazing thing is that the sauce is only simmered for half an hour and yet it’s still super rich and delicious. I like to cook the vegetarian sausages beforehand rather than in the sauce. I just follow the packet instructions. Vegetarian Sausages: Use whatever brand you like, I normally go for Linda McCartney, they do a really yummy red onion and rosemary version. Cook them according to packet instructions before starting. Worcestershire Sauce: Make sure you get a vegetarian version. 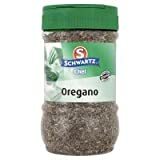 Dried Herbs and Spices: We went with smoked paprika for a delicious smoky flavour, dried thyme and oregano, a bay leaf and sprigs of fresh thyme. 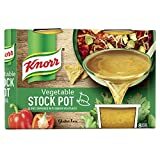 Vegetable Stock: We love the knorr stock pots, they have so much flavour and are so easy to use. Red Wine: We’re not big red wine drinkers but we always keep a bottle on hand to use for cooking and I recommend you doing the same. 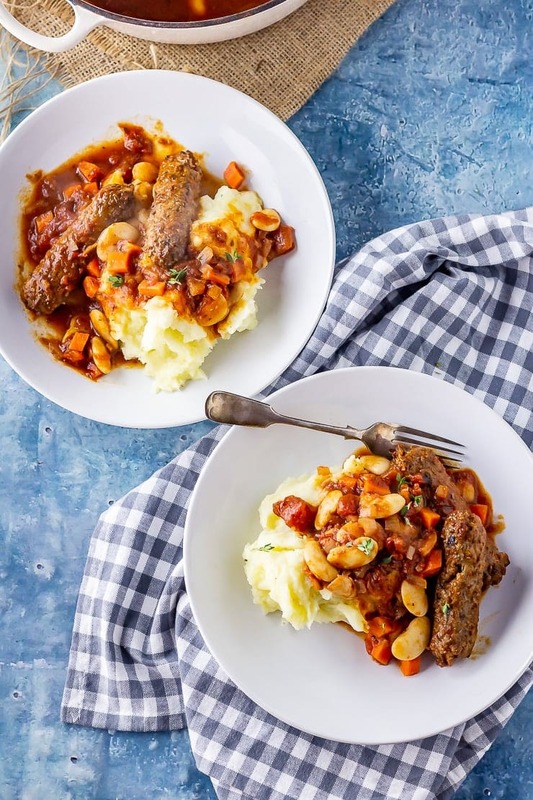 Butter Beans: I adore butter beans and think they’re perfect for bulking out so many meals but if you prefer a different bean then that would work just as well. 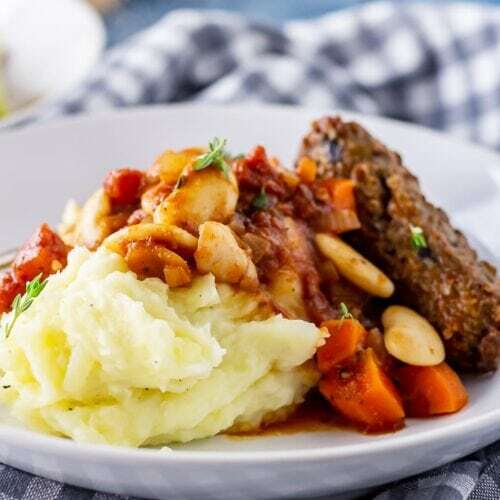 Fry the onion and garlic: Add a little oil to the pot and fry your onions and garlic until softened then add the chopped tomatoes, paprika, stock, Worcestershire sauce, sugar, thyme, oregano and bay leaf. Simmer for 20 minutes: Until the sauce is thickened. Add the sausages and beans: Cook for another 10 minutes until everything is heated through. Add extra veggies. You could easily bulk this out with other veg, broccoli or spinach would be great in here. Try using different herbs and spices: Instead of smoked paprika you could try a little chilli powder to make it spicy or add some rosemary along with the thyme. 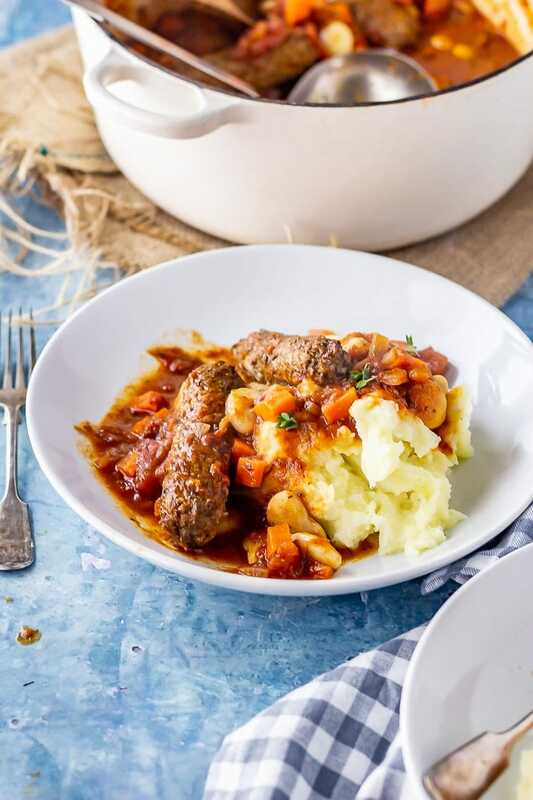 The thing I love about this sausage casserole is that it has all the comforting flavour of a much unhealthier dish but it’s actually pretty good for you! Especially since we aren’t using traditional pork sausages which are normally loaded with fat. 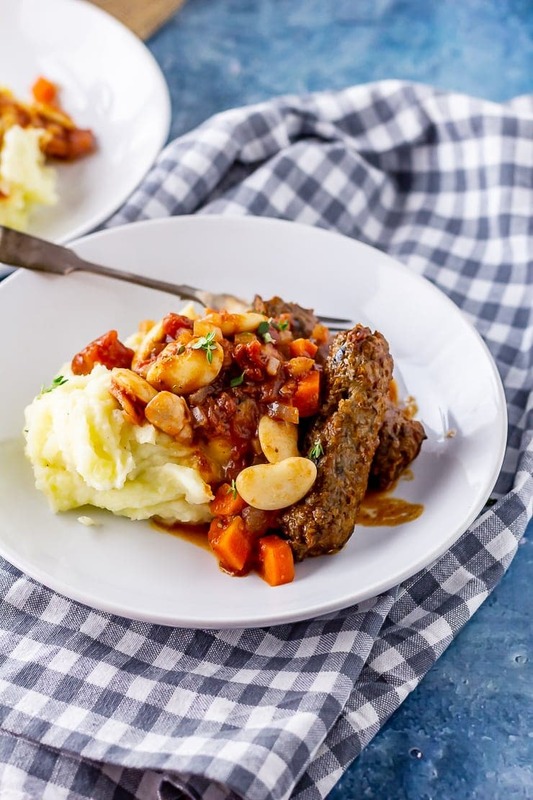 The sauce is made from plenty of healthy ingredients including tomatoes and beans which makes the whole thing pretty light while still satisfying. What goes with sausage casserole? 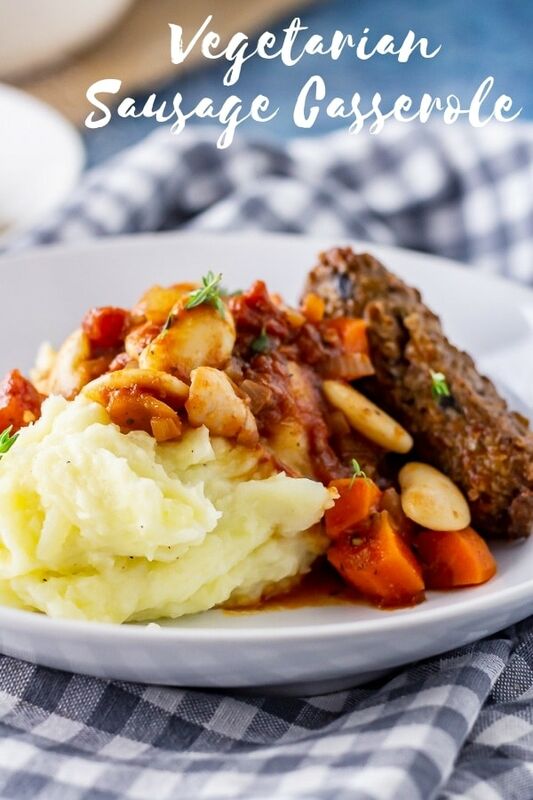 For me there is nothing better to serve with sausage casserole than a big pile of mashed potato, honestly the ultimate comfort food, but if you’re looking for something a little lighter then you could definitely just go with some veg like broccoli or cauliflower and you’d still have a filling meal. Want more? 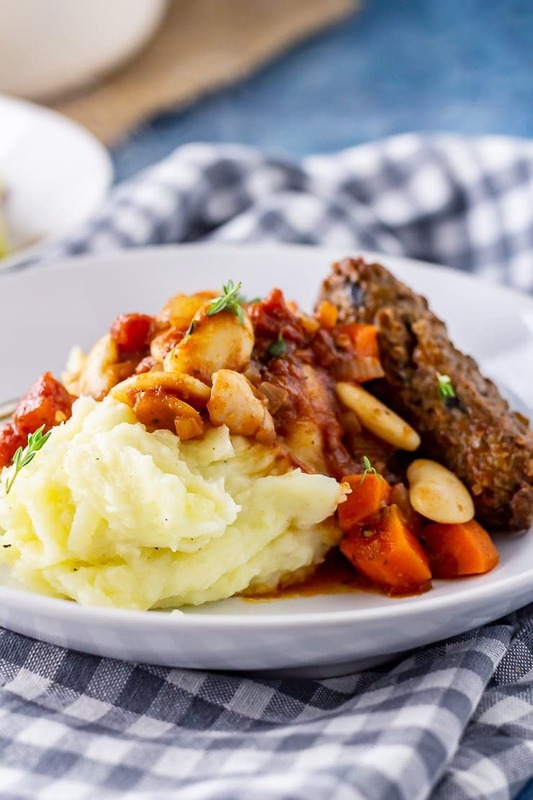 Try these other casserole recipes! 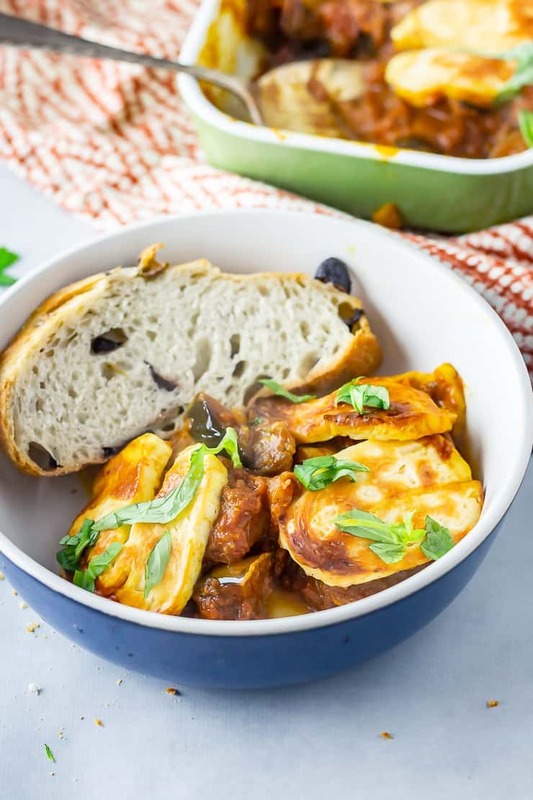 WONDERING WHAT TO DO WITH THE LEFTOVER INGREDIENTS YOU’VE GOT FROM MAKING THIS VEGETARIAN SAUSAGE CASSEROLE? 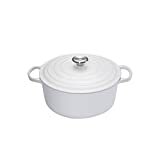 Heat the oil in a large casserole pot over a medium heat and add the onion. Fry for five minutes until softened and translucent the add the garlic and cook for another 2 minutes. Season to taste. Add the smoked paprika, tomatoes, stock, Worcestershire sauce, sugar, dried thyme, oregano, bay leaf, fresh thyme and wine and stir everything together. Bring to a simmer then place a lid on and leave for 20 minutes. 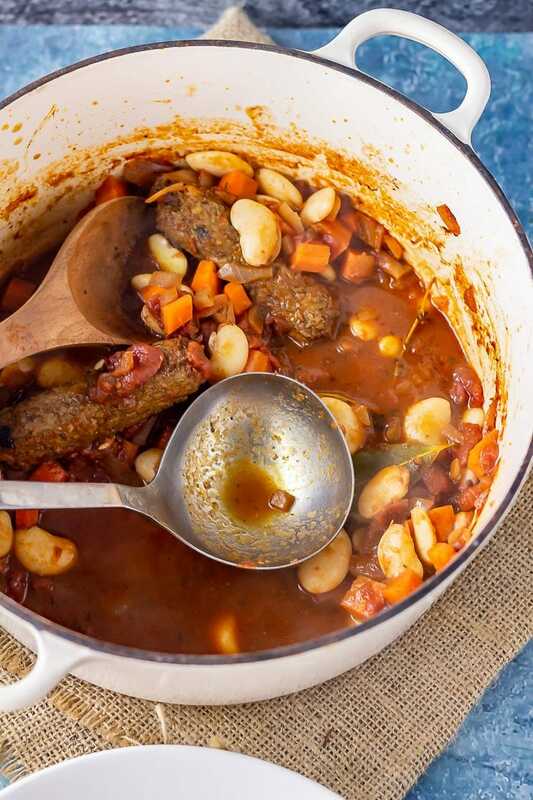 Add the beans and cooked veggie sausages to the sauce, season with plenty of salt and pepper and cook with the lid off for another 10 minutes until everything is warmed through and the sauce has thickened slightly. Serve. Looks like great comfort food. I love all the options you give for personalizing the recipe to individual tastes. 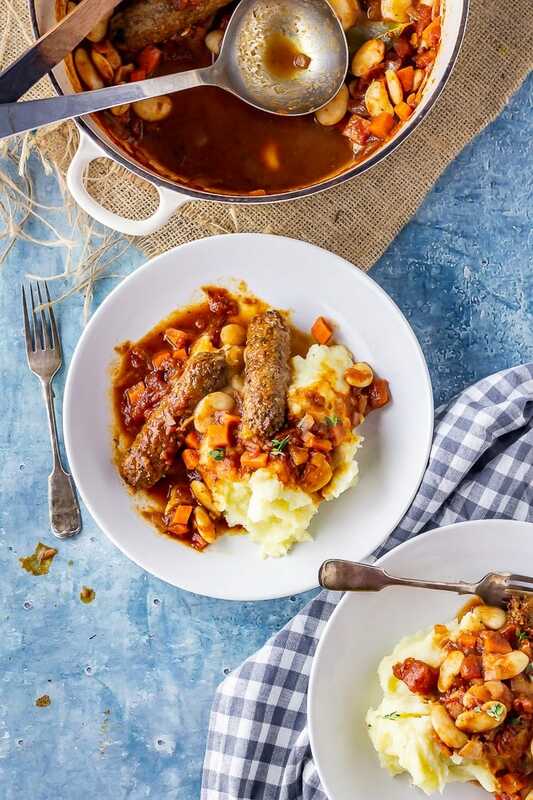 Perfect casserole for the winter months!! I can’t wait to make this for my family! 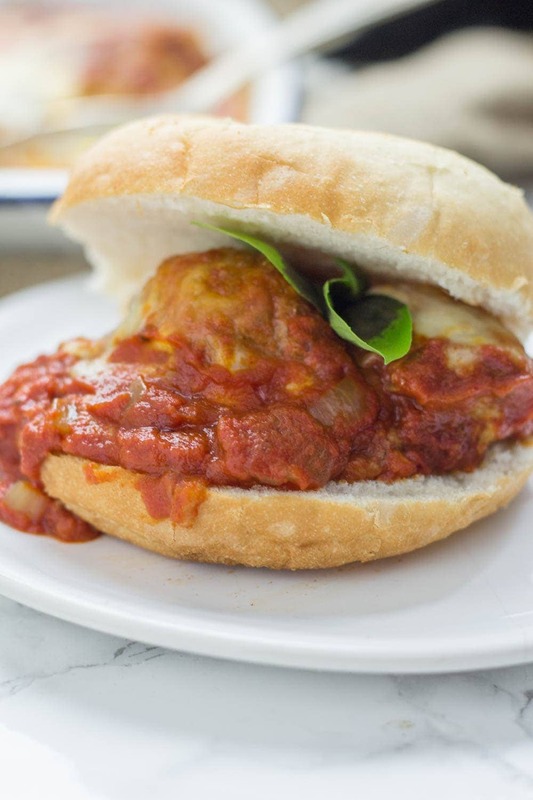 I’m a vegetarian but I’m always looking for recipes that my meat-eating friends would enjoy so this one is perfect!